Can I Sit With You? Redwood City Recap | Can I Sit with You? Our very own Jen Myers reading her story Sorry, Charlie. 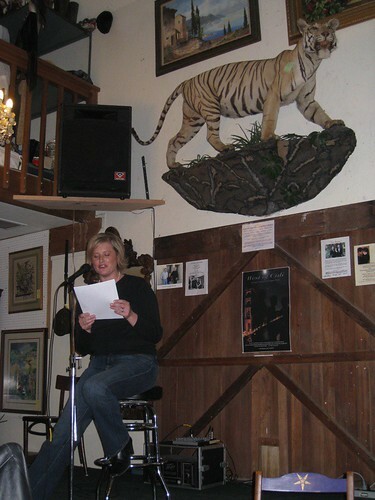 Last night’s reading at Angelica’s Bistro in Redwood City was a lot of fun, and quite a success. We filled the place, which was good for us though harrowing for the restaurant staff. We were thrilled to see so much support for the project, sell so many books, and have guests like Grace Davis and Left Coast Mom in the audience. A few restaurant patrons who didn’t realize there was going to be a show but stayed to watch anyhow (we’re that mesmerizing!) came over afterwards and donated money to SEPTAR, the special ed PTA to which all of the Can I Sit With You? proceeds are directed. Very touching. Go see photos of all the readers (except Shan, who took the pictures). Video excerpts to come. Y’all are AWESOME!!! I am so proud to be able to sit with you!